(Right) Emil Kintalakadi, a member of the Tirari nation, east of Lake Eyre, ±1901. Fossils did not go unnoticed in human societies that Victorian scholars once disdainfully labelled ‘brutes’, ‘savages’ and ‘primitives’. With renewed vigour, today’s geomythologists explore the ideas traditional cultures harboured regarding the nature and the origin of bones and stones they encountered on the surface, embedded in rock, or anywhere else. The American classicist, Adrienne Mayor, has documented that the first nations of the Americas, just like the Greeks and Romans, recognised that fossils were the remnants of creatures that lived in previous eras and, in many cases, did not die a natural death. Intriguingly, pre-modern fossil lore does not stop there, but often identifies the extinct life forms with a mythical race of beings that dwelled in the sky before its extermination during a cataclysmic, lightning-charged battle, or a world-engulfing fire or deluge. Though compelling parallels have been adduced, scholars have not yet documented the global extent of such ideas. One case that has so far eluded discussion in this context is the local mythology surrounding the bones found in the vicinity of Lake Eyre, in the Tirari Desert of northern South Australia. The species represented here are predominantly those of vertebrate animals associated with the Tertiary age. 'Instead of the present brazen sky, the heavens were covered by a vault of clouds, so dense that it appeared solid; where today the only vegetation is a thin scrub, there were once giant gum-trees, which formed pillars to support the sky; the air, now laden with blinding, salt-coated dust, was washed by soft, cooling rains, and the present deserts around Lake Eyre were one continuous garden. The rich soil of the country, watered by abundant rain, supported a luxuriant vegetation, which spread from the lake-shores and the riverbanks far out across the plains. The trunks of lofty gum-trees rose through the dense undergrowth, and upheld a canopy of vegetation, that protected the country beneath from the direct rays of the sun. In this roof of vegetation dwelt the strange monsters known as the "Kadimakara" or "Kadimerkera"'. 'Once, while many Kadimakara were revelling in the rich foods of the lower world, their retreat was cut off by the destruction of the three gum-trees, which were the pillars of the sky. 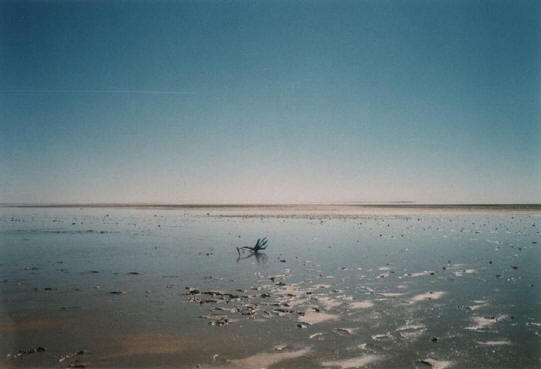 They were thus obliged to roam on earth, and wallow in the marshes of Lake Eyre, till they died, and to this day their bones lie where they fell'. The story concludes with the collapse of the solid sky, an event that must also have been thought to have precipitated the onset of the dry conditions prevailing in the area today. At least until the end of the nineteenth century, the Dieri continued to make pilgrimages to the bones and hold corroborees to 'appease the spirits of the dead Kadimakara, and persuade them to intercede with those who still dwell in the sky, and control the clouds and rain'. 'It may have arisen as a pure fiction, invented by some imaginative, storytelling native, to explain why large bones are scattered over the bed of Cooper’s Creek. It may, on the other hand, be a shadowy reminiscence of the geographical conditions which existed in some distant ancestral home of the aborigines, or of those which prevailed in Central Australia, at some remote period'. A little more reflection disqualifies the former option, as the Dieri would hardly have founded elaborate rituals and a collective belief on the fantasy of an individual. Comparison of the Dieri story with a similar tradition from the Arrernte people, farther to the north, suggested to Gregory that the myth was based on a core narrative involving the 'idea of a sky-country, to which communication was formerly possible by climbing up a tree or pole'. This elementary backbone of the story aligns itself with the mythology of a sky-reaching column mythologists refer to as the axis mundi or ‘world axis’. Gregory further concluded that the Dieri 'have modified the story to explain the occurrence of the great bones in the rivers of their country'. He made no bones of his finding that a systematic pattern pervades fossil lore: 'As a general rule, where stories of giants and dragons are assigned to precise localities, they are founded on the occurrence of fossil bones'. This rule of thumb finds a much wider, cross-cultural application. As the outlines of the story seem to represent a global archetype, it stands to reason that events in the cosmic environment surrounding the earth spawned the myths. The million-dollar question is whether the tendency to link local fossils with this mythical prototype was an imaginary or whimsical appendix to the myth or whether the actual deposition of the fossils was entwined with environmental disasters accurately recalled by these people. The answer may very well prove to be the former. However, it may not be coincidental that Pleistocenic vertebrates – such as the so-called ‘megafauna’ – are often among the fossils that attract myths of cosmic disaster. Besides some mundane animals such as dingoes, bats, crocodiles, rodents, and birds, the specimens collected by Gregory’s team also included a Diprotodon sp. 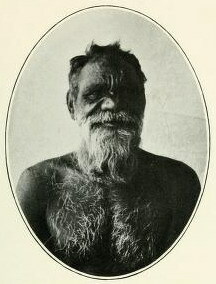 or giant wombat, which Emil Kintalakadi, one of the last surviving Tirari tribesmen, readily identified as a Kadimakara. Surveying the tribal lore, Gregory noted that the creatures identified as Kadimakara appear to involve 'two distinct animals', one a water monster possibly related to the fossil remains of crocodiles in the rivers of Lake Eyre, the other a unicorn-type beast, 'a big, heavy land animal, with a single horn on its forehead'. A striking parallel emerges with several North American cultures, who likewise associated local fossils with two groups of mythical entities, water monsters and their supposed rivals, the thunderbirds. Gregory advanced the perfectly reasonable proposition that Dieri people may have recognised the perished breed of celestial monsters in Diprotodon fossils they sighted in their lands. Does this preclude any direct relationship between the fossils and the myth of legendary sky travellers? Perhaps not, though one must tread very carefully. Interdisciplinary studies involving plasma physics and archaeoastronomy suggest that much in the global myths concerning the end of a ‘golden age’ can be explained on the hypothesis of a solar storm of unprecedented proportions, provoking intense geomagnetic disturbances and near-lethal synchrotron radiation emitted by magnetospheric plasma, possibly in combination with a cometary interloper. These events are conjectured to have occurred between the end of the Pleistocene – when a comet is also thought to have impacted or exploded over North America, according to Firestone and West – and the end of the Neolithic period. If myths like the Kadimakara tradition preserved a memory of this tumultuous period, the presence of megafauna among the purported fossil remnants at Lake Eyre as well as in North America, where mammoths and mastodons exemplify the case, makes sense. Could it be that the Dieri, like other pre-modern societies, had a sense of the type of mammals that perished during what was arguably the latest great extinction event in geological history? Indeed, is it conceivable that the Dieri did not take this myth with them from an ancestral homeland, as Gregory tentatively suggested, but were already stationed on the Australian continent at the time of these events, witnessing the eradication and fossilisation of the unfortunate animals – including, possibly, humans – first hand? Although rock-solid evidence for this suggestion cannot be marshalled at this time, no stone should be left unturned in the giant jigsaw puzzle that is the planet’s ‘recent’ past.